The Company’s investment objective is to provide shareholders with capital growth and real growth in dividends over the medium to longer term from a portfolio of securities listed mainly in the UK equity markets. The Company invests mainly in UK equities and equity-related securities of UK-listed companies. The Manager invests mainly in companies that offer a combination of good capital growth prospects with the ability to increase dividends over time. Market exposure may also be gained through the limited use of derivatives, the purpose of which would be to achieve changes to the portfolio’s economic exposure. The fund charges a total expense ratio of 0.70% per year. The dividends per share have significantly increased over the last 10 years showing strong growth above inflation. The total increase was 171.16% (9.49% annualized). 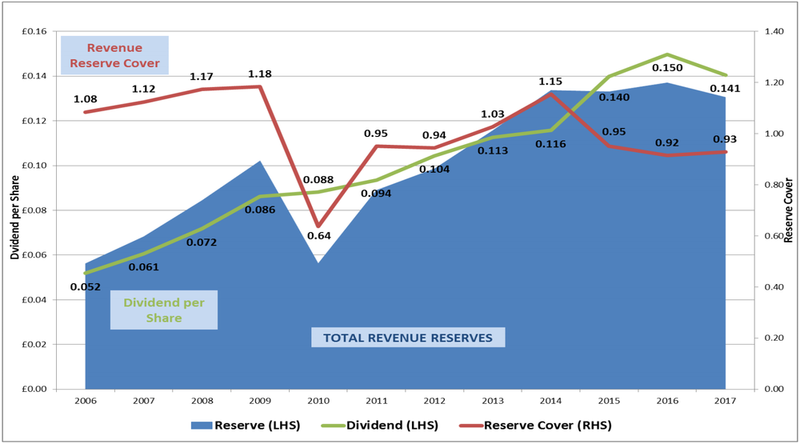 The revenue reserves have not been increased at the same rate as the dividends, with an increase of 132.31% (7.96% annualized), which means that the reserve as a percentage of the dividends has reduced over the period. The reserve cover was 1.08 years in 2006 and ended with 0.93 years in 2017. Over the period, the company has paid out cash reserves to maintain the strong dividend increases, which has reduced the revenue reserve. The 10 year change in revenue reserves is 5.16% p.a. versus RPI at 1.92% p.a.